Lowdown: A taxi driver dying of cancer drives across Australia towards euthanasia. One of the charms, for lack of a better word, of non Hollywood movies is their naïveté. As in, not all movie in this world have to be about cash grabbing and box office income. Last Cab to Darwin is such an example, a lovely Australian film that - as lovely as it is - sets its aim on too large a target to be a hit. We follow Rex (Michael Caton), a oldish taxi driver from Broken Hill NSW. That town is officially a dying town, an old coal mining town in the thick of Middle of Nowhere, Australia, that is now running out of water IRL. Our hero has mates and people that know him around town, but he never stepped out of Broken Hill and into the world. Rex lives on his own, sort of, having an interesting relationship with the female aboriginal neighbour across the road, Polly (Ningali Lawford). Then he gets the news that he is dying of cancer, and dreading the prospects of having to lie at the mercy of others he sets out to Darwin - a city on the northern top of Australia where [as per real life events] there is a doctor offering to test the law and attempt euthanasia (Jacki Weaver). So he sets out on a long drive, on his own and without telling anyone, to Darwin. Just him and his cab. Only that, on his journey, he meets all sorts of people and experiences all sorts of experiences, and these make a difference. Thus Last Cab to Darwin ends up a mixed bag. It is full of cliches, both of the Australian type and the run of the mill ones that often fill B grade films. On the other hand, it deals with some heavy themes that usually can take over entire movies on their own - Australia's dealings with its original land owners, euthanasia. And it just happens to bite more than it can swallow. Overall: A nice film to watch for the right mood, but a compromised one at that. 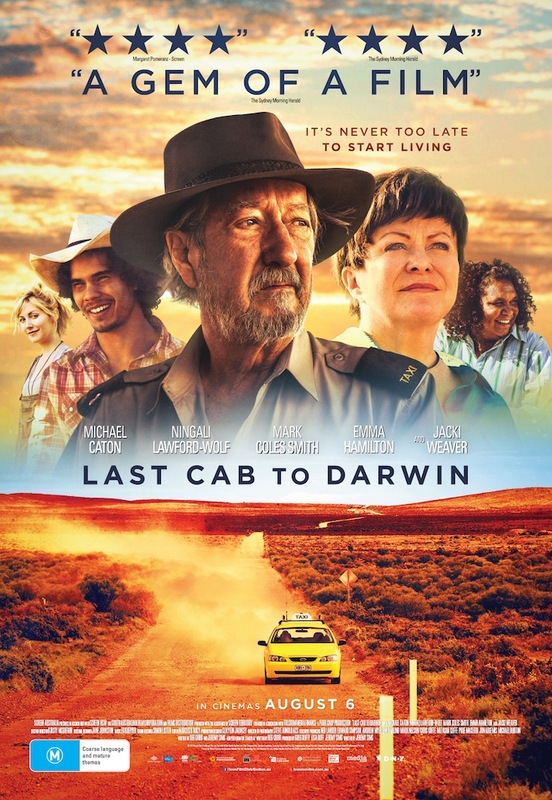 Last Cab to Darwin is thus a 3 out of 5 crabs movie.